Can you believe I forgot to take a picture of me in my yukata!? Oh well, I didnt have many pictures left and there were cooler things to take pictures of. I will! take a picture and send it off sometime. Speaking of sending things off, I have 4! cds each with about 160 photos to send back soon. I am off to Nara today with the mother of one of my little brothers friends(?) and will take lots more there too. back to the Festival. 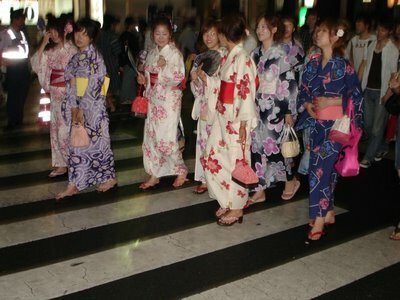 We just walked up and down the street for a couple hours in crowds of other people wearing yukatas and nonyukatas. I was standing on a street corner, and some little (middle school) girls ran up next to me and their friends started taking pictures. They said I looked like a doll. I want royalties. We were going to go to the really big part of the festival, but it rained like crazy, and my mom didnt want us getting sick. It is raining like a mile and hour here, and thats not the speed. In one hour, we get about a mile of rain fall! Run! It's Giant Japanese High School Girl!